Our Legal Kits are a convenient, quick and easy way to help ensure your wishes are made clear. 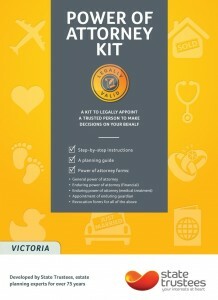 Legal Kits are available to purchase online or from selected retail outlets in Victoria. A convenient, quick and easy way your complete your will. Legal Will (single pack) is valid for all jurisdictions in Australia. Single pack contains one will form. buy a copy from major Australia Post stores or selected newsagency outlets in Victoria. 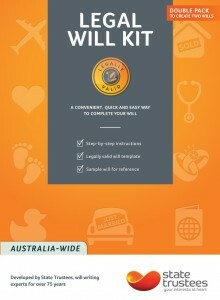 Legal Will (double pack) is valid for all jurisdictions in Australia. Double pack contains two will forms. A kit to appoint a trusted person to make decisions on your behalf. Power of Attorney Kit is valid for all jurisdictions in Australia. A kit to make a statement of facts you declare to be true. 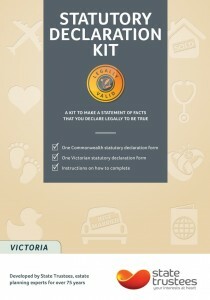 Statutory Declaration Kit contains one Commonwealth statutory declaration form and one Victorian statutory declaration form. Statutory Declaration Kit is available to purchase from major Australia Post stores or selected newsagency outlets in Victoria.